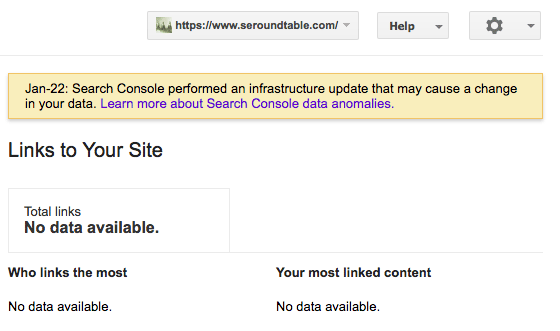 On Friday morning, the Google Search Console link report starting bugging out, where it showed "no data available" in the link report for many. Now, that bug spread to virtually all webmasters in their link report. This is not an issue for your site, rather a bug in the Google report. Things will eventually return back to normal. Thanks for reporting this, folks. This is a known issue at the moment, and should be resolved in the near future. Thanks for your patience! Gary Illyes from Google responded on Twitter saying "It'll come back." It will, this happens not too infrequently. So don't worry, this does not impact your rankings. It is just a reporting bug. Forum discussion at Twitter, Google Webmaster Help and Black Hat Forums.